Chef Trân` thi Mai learned how to cook from the owners of the outside restaurant and has been cooking for five years. 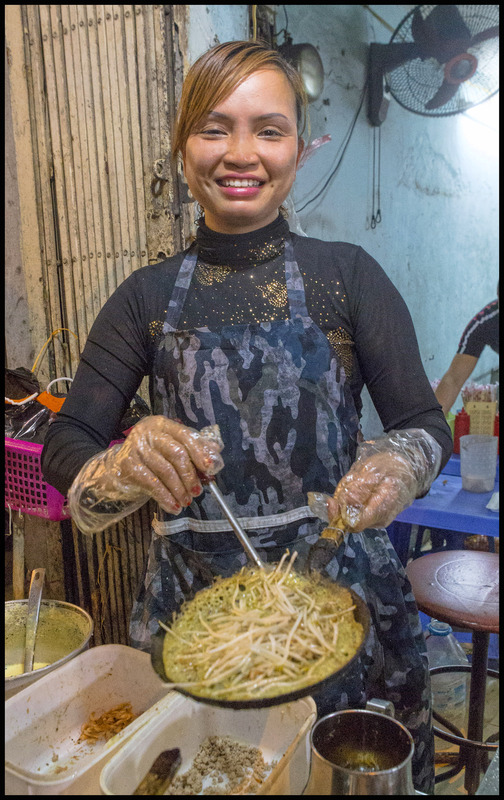 She can cook six skillets of Bánh xèo at a time. Bánh xèo means “sizzling cake” in Vietnamese, but they are commonly called “ pancakes” in English. The ’sizzling cake”, gets its name for the loud sizzling sound it makes when the rice batter is poured into the hot skillet. It looks like a French crepe with crispy edges. The batter is made from rice flour, water, and turmeric powder. While still in the pan, pork, shrimp, bean sprouts, diced green onions, are added. It is then lightly fried in a skillet or wok making the edges come out crispy while the center remains soft. Then the crust is folded over to form what looks like a huge yellow crepe or omelet. After being served, chunks of the cake are torn off and wrapped in rice paper, along with lettuce, mint, basil, or other herbs, then dipped in a thin sauce known as nuoc cham (fish sauce mixed with water, garlic, sugar, chili, and lemon juice). Diners can watch their pancakes being prepared. Banh xeo is a healthy dish that is low in fat and cholesterol, so health-conscience diners will appreciate enjoying its tantalizing flavors. Only the most natural ingredients are used in creating banh xeo. All the different flavors come together for an absolutely delicious dish.